If you’ve never had a bourbon ball, it’s safe to say you’ve never spent the holidays in the South. And for that, I’m sorry. But but but, I’m here to remedy that. 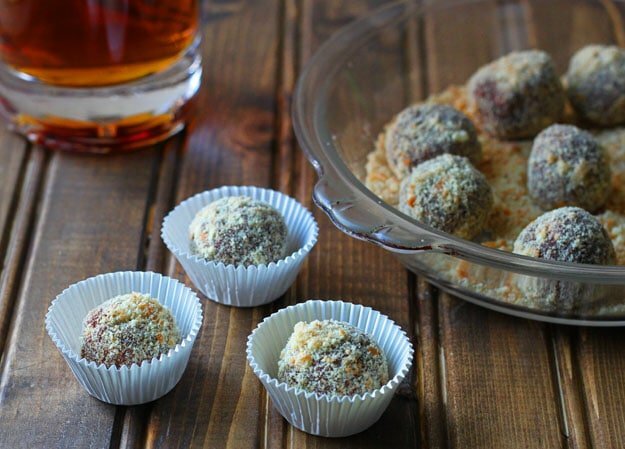 Bourbon balls are easy to make (no baking required) and are addictively delicious. They consist of crushed nilla wafers (the greatest store-bought cookie ever, although I do have a recipe here for a homemade vanilla wafer cookie), pecans, spices and bourbon. You can use whiskey, too. 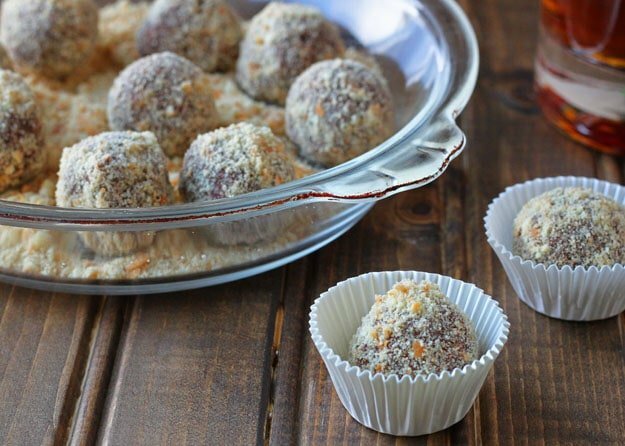 Maybe you’ve had a rum ball before? Same principle: mashed cookies reformed into boozy truffle-like bites. I should say: these cookies are for adults. There is no denying their alcohol content and flavor. And, the alcohol aroma seems to get stronger as they sit. I used to have a boss (hi Jim!) who baked cookies for our workplace each December. He would bring in plates and plates filled with dozens of all types of holiday cookies. I always went for the rum balls because who can resist a little alcohol in the workplace setting? Something about a little hint of booze in a strict corporate workplace is my idea of a devious good time. It’s not enough booze to alter your mood, so it’s a safe indulgence, I promise. Regular Christmastime bourbon balls contain cocoa powder and corn syrup as the binder. 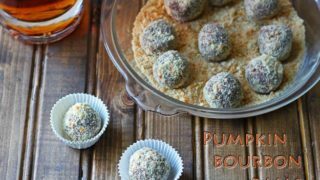 However, these Thanksgiving pumpkin spice bourbon balls use pumpkin and fall spices to pull it all together. Once you pop one, you can’t stop! In the bowl of a food processor (or a plastic zip-top bag), pulverize the nilla wafers. You should end up with about 1/2 cup of cookie crumbs. Set aside. Next, finely chop the pecans in the food processor (if you haven't already). The pieces need to be very small, but be careful not to overmix and make crumbs or a paste. You want finely diced, not crumbs. Combine the cookie crumbs, pecans, powdered sugar and spices in a small bowl. In a small cup, stir together the whiskey with the pumpkin. Pour this mixture over the crumb mixture and stir very well to combine. Use a tablespoon to make evenly sized balls and roll them between your hands. You can coat the balls in more cookie crumbs or chopped pecans, if you wish. Chill 1 hour before serving. I like to serve these cold, but some prefer them at room temperature. Nilla wafers for the coating is totally brilliant. I love these! I can’t wait to make these. A perfect Thanksgiving Day treat. oh man, my in-laws and jason would LOVE these!! they’re from the south and I’m not quite sure they’ve ever had these before – i seriously must make some for them!! Boozy things in the workplace are a good time indeed :) I want a whole plate of these! These are terrific finger-size holiday treats for the young at heart! Love how easy they are! I really want to spend the holidays in the South if this is the kind of thing I’ll get to eat!! I’ve never had a bourbon ball OR a rum ball before. :( I’m remedying that now by making these. They sound divine! Awww, man…these are calling my name! Ahhh, bourbon balls. The holidays truly have arrived! Good thing I busted out the Pandora “Swingin’ Christmas” station last night and impulse bought a “Snow Day” scented candle, lol. All I need is one of these amazing-looking treats, and I’m in business! Ahh bourbon balls. One of my favorite signs that the holidays are here! I have never tried a pumpkin one, but they sound incredible! Is it wrong to be craving one at breakfast? And who can resist a little alcohol in a workplace setting? Haha I love it! I’m from the south and must say I’ve had my fair share of Bourbon Balls. They are delish. I love the Thanksgiving spin you put on these. Must give them a try! I’ll have a large glass full thank you! I’ve never had a bourbon ball… or spent any holidays in the South… So you’re assertion is totally valid. I think that needs to change. I’m always looking for different Christmas cookies and this is definitely going on the list! My aunt makes these every year for thanksgiving – so good!!! YUM! I want to make some of these to give as Christmas gifts! Homemade gifts (especially food) are the best! 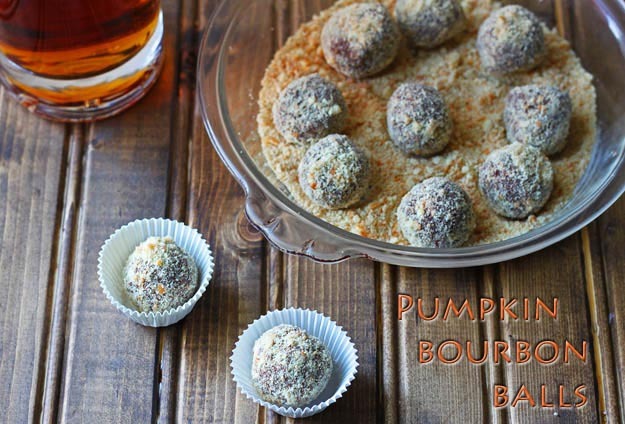 I feel myself getting a little tipsy just looking at these gorgeous bourbon balls. What a great treat for the grown-ups! I love this recipe!! I’m thinking of sweet treats to include in my holiday basket and this gives me such a good idea — thanks :D I love the addition of pumpkin yuuuummm! You have some of the most fabulous ideas! I never would have thought to grind up nilla waffers with bourbon, seasoning and pumpkin puree for a fantastic treat! This is a total winner of a dessert and I could make batches and batches of these for holiday goody bags for friends and family! there’s a lot of ball jokes i could make this one…but i’ll just say YUM! My mom makes bourbon balls EVERY Christmas. Love this pumpkin twist! I am going to try this with JD Honey Whiskey! And roll them in ginger snaps instead of Nilla Wafers. This sounds like a perfect way to use up extra pumpkin! Can’t wait for Turkey Day! never had this, never even thought of this, this looks brilliant. I am allergic to nuts. Will they hold together w/o them or do I just add more of the waffers? Can’t wait to make these!